We built it. We can build better. Current infrastructure is the cause of Peak Oil and Global Warming. We planned this infrastructure. Building sustainable infrastructure requires we change what we do. Ingenuity, forging a new what, requires governments replacing plans with performance standards. Define what we need. Allow innovators to create it. Oil based Energy Growth stopped in May 2005. Economic Growth must come from Efficiency Growth. Lucky for us, this is easy because we are currently less than 4% efficient in urban transport, less than 20% in all transportation and less than 31% efficient in power generation. Growing dependent on ingenuity makes our economy more nimble, adapting to necessities and opportunities. We know 423-mpg (miles per gallon) transport is practical. CSX’s current television commercial shows a Prius being driven onto a rail car and notes that railroads can “move a ton 423 miles on a gallon of fuel.” Morgantown’s Personal Rapid Transit (built in response to the 1973 Oil Embargo) has delivered 110 million injury-free, electrically powered, urban passenger miles. Leverage these successes. Beat 100 mpg, 5 times current gas mileage standards (CAFÉ, Corporate Average Fuel Economy). Start small; iterate often. Set an objective for innovation and grant rights of way to anyone willing to privately finance and build transport to beat that standard. We know there is vastly better, cleaner and safer transport. Obtaining it requires a free market, allowing risks, innovators and small, non-traditional suppliers. Governments currently plan and regulate against this. Government central planning for transportation and power generation infrastructure has resulted in urban transport that is less than 4% efficient. Yes, 96% of energy is wasted driving climate change. Mobilizing for World War I the innovations of Ford, Bell, Edison and the Wright Bothers became monopolizes for security reasons. After the War, infrastructure deployments were considered “natural monopolies”. Refinements were allowed, the “know-how,”. But innovation, the “know-what,” was frozen in time. Ford, Bell, Edison and the Wright Brothers would not be allowed to apply their ingenuity today. Their businesses started too small; their ideas were “unproven.” Issues with permits, insurance, rights of way would have killed their ingenuity. In a planned economy ingenuity is doomed. In a free market, ingenuity has an improbable chance of churning into commercial success; fortunately, there are many entrepreneurs willing to expend their every resource in that improbable hope of getting lucky, of forging breakthrough from insight, will and preparation. Unleash these people by providing standards like Beat 100 mpg. It was not until the 1984 de-monopolization of communications infrastructure that ingenuity was allowed again, in one sector. Once exposed to competition, the analog communications network of 1984 radically re-tooled “know-what”. The analog networks become digital, rotary phones gave way to touch-tone, then cell phones, then the Internet with its compound ingenuity, democratized knowledge and communications at prices never dreamed of at de-monopolization. Germany de-monopolized power generation infrastructure with Feed-in Tariffs. Germans, free to invest private capital, Germany, the size of two Midwestern states and about the latitude as Winnipeg Canada, has more solar collectors than the entire United States. A change of “know-what;” Germans are creating jobs and economic lifeboats to weather these times of uncertain energy. What is the payback on having a lifeboat when you need one? Transport is still monopolized by urban planners. Protected from competition we must pay to move a ton to move a person in congested commutes. We have better cars, “know-how.” But we are stuck with the same “know-what.” Peak Oil and Global Warming are the consequence of our current wasteful infrastructure. We built it; we can build better. De-monopolizing transport rights of way, allowing competition to “know-what,” and within 6 years multiple solutions will exist for on-demand personal transport that will beat 100 miles per gallon (beat100mpg.com). Most likely, there will be no gallon; the networks will be solar powered, running on electricity. The distributed nature of the transport network can be used to harvest distributed natural power sources. JPods, the company I work for, can build 200-mpg systems for people and 400-mpg for cargo today. Similar systems are being built at Heathrow Airport, Uppsala and the zero-carbon city of Masdar in Abu Dhabi. Ingenuity is the process of discovering “know-what.” Investing in “know-what” ideas and people is disruptive, rare events with sweeping consequences. Allowing anyone who can produce at better than 100-mpg transport will initiate a cascade of innovations. Current costs will be preempted, creating jobs and profits. My personal guess is that in 30 years urban transport will be less than 25% of current costs with zero emissions and zero congestion. It costs less to move less. Why are we paying to move a ton to move a person? Following is a summary of why oil can no longer build our economic engine; why ingenuity must be allowed – and encouraged. Energy Growth stopped in May 2005. The graph at the top of the article is World Crude Oil Production from the Energy Information Administration (EIA). There is similar data from the International Energy Agency (IEA). These governmental agencies track data on energy for policy makers. New oil discoveries peaked in 1964. Recent discoveries are not as large or as accessible as those oil fields on which our economic growth developed. There are two other measures of oil production. Total Liquids and Total Exports. The total liquids report includes all forms of liquid fuels. Many of these liquids require almost as much petroleum energy to produce as they provide. Furthermore, by focusing on total liquids, it is possible to double-count energy that can create economic work. Since our economy depends on work, creating and moving things, this double counting of supply hides risks. Total Exports, oil available to drive the world economy, is the best measure for understanding economic growth. Reports on Total Exports require mining data from the EIA and IEA. Following are the recent numbers and trends. Hopefully, these agencies will organize their data so export information is more vivid. Oil Export are Decreasing. Total Exports illustrate why oil prices are rising. This Wall Street Journal article outlines by region the declining availability of exports. Depleting local oil fields. Oil is a finite resource. Increasing domestic consumption as exporters build their economies. Using Total Exports from 2005, comparing subsequent Exports clarifies why oil prices seem to be riding a rocket. Exports in 2005 were 46.342 mbpd (million barrels per day). Exports in 2006 were 45.838 mbpd, down 1.10%, 504 mbpd or 184 million barrels below 2005. Exports in 2007 were 44.832 mbpd, down 2.24%, 1,509.7 mbpd or 551 million barrels below 2005. Exports in 2008 are down another million barrels per day below 2007, or about 4.5% below 2005. Matt Simmons' estimates future depletion at 8% per year. Hoarding for domestic needs by exporters may accelerate this rate. 1973 Oil Embargo. In the following graph, the oil deficits in 2006, 2007 and likely 2008 are compared to the oil deficits from the 1973 Oil Embargo. The deficit from the 1973 Oil Embargo is likely overstated. It is calculated based on the worse rate of loss, 4 million barrels per day being applied to the entire Embargo span. Economic Work. If a barrel of oil equals a unit of economic work, the economic loss from the 1973 Oil Embargo is 724 million. This approximates the loss of economic work in 2006 and 2007 of 735 million. Economic loss in 2008 is on pace to double the losses of the 1973 Oil Embargo. Economic losses combined for 2006, 2007 and 2008 are 3 times worse than the 1973 Oil Embargo. A reasonable guess is that 2009 will be 5-6 times worse. Unlike 1973’s supply shock that hit everyone, current “demand destruction” is a shortage based on the size of your paycheck. Home foreclosures for the economically weak are doubling nearly every year since 2005. Combining EIA report on income verses gas prices (http://www.eia.doe.gov/emeu/rtecs/nhts_survey/2001/) with home foreclosures provides a clear indication of the Peak Oil consequences. EIA stopped updating this report as of 2004. It would be beneficial to have this report continue as a measure of economic work. Gas prices verses disposable income and food prices verses disposable income may be the best measure of economic health at the worker level. The economic desperation experienced in first half of 2008 by working people is not reflected in standard models for recession. We are like the proverbial frog in a pot of cool water set on a burner. Worse, the economic stimulus Congress passed is like tossing a few ice cubes in the water while tossing the dollar on the fire. Durability. A current EIA report that does reflect depleting exports is the TWIP (This Week in Petroleum, http://tonto.eia.doe.gov/oog/info/twip/twip_crude.html) Following is the June 4, 2008 report showing inventories are at the bottom of their historical range. If these inventories fall below the historical range (blue) panic buying and supply outages should be expected. A less obvious measure of depleting exports can be found in the world press reports on the decrease in economic work: trucker strikes, food shortages and other ominous indicators that infrastructure dependent on oil is no longer functioning as it did when oil was $3-$80 a barrel. 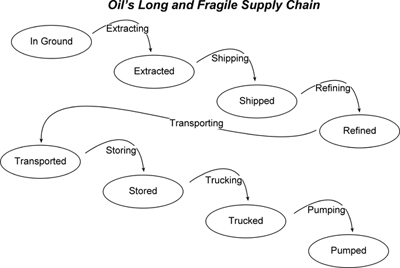 Oil infrastructure is complex. It depends on a sequence of actions flowing at 80-98% efficiency. A good part of the reason a gallon of gas last year cost about the same as a good cup of coffee is that the petroleum industry is a marvel of what can be accomplished by dedicated people. 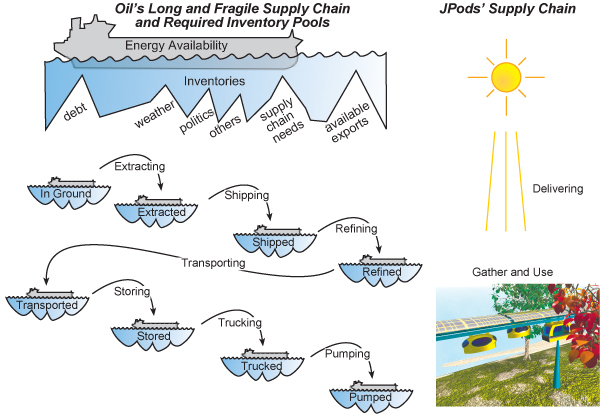 Inventories, indicated by EIA’s TWIP report (above), abort small bumps and shocks that occur in the oil supply chain. Dropping inventories indicates diminished ability to adjust. 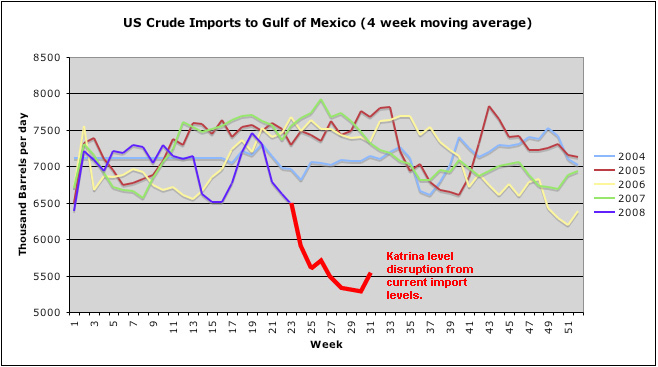 Hurricane Katrina and imports from Mexico and Venezuela (as reported by EIA) indicate scale. The following EIA data shows years in colors. Red is 2005 and the large drop was caused by Hurricane Katrina. The year 2008 is purple. The oscillations and lower volume indicate instability. With current low inventories, a hurricane anywhere between Venezuela and Louisiana would likely cause food distribution disruption. Based on Katrina, that disruption could last 10 weeks. Most homes and stores do not carry 10 weeks of food. Without good policy and ingenuity to increase efficiency, we now depend on luck to sustain food distribution. Increasing Canadian oil imports would require expanding the oil sands projects. These are already an environmental disaster and have consumed all available water and labor supplies. Increasing capacity would require years. It is doubtful the Saudi’s have spare capacity. More shipments to the US would not arrive for a month, assuming ships and oil were available to make deliveries. If more ships had to be built we would have to wait years. The long supply lines create a host of security risks. Mexico, the U S's third largest supplier, is in crisis depletion at super-giant Cantarell Field. Production at Cantarell has dropped 50% from its peak in Dec 2003. Mexico's domestic use of oil has increased, further decreasing oil available to importers. If I were Mexico, I would immediately cut production by 40-60% and sell only $250 barrel oil. They need to protect their revenues and extend the life of their exports. Venezuela, the U S's 4th largest supplier, has similar depletion issues as Mexico. To this can be added hostile politics. It typically takes 6 years to develop and bring an oil field to market. If your can wait 6 years between your gas tank fillings, then this might work. If not blocked by policy makers, the 423-mpg we know is practical and possible can be developed in cities and towns. About 4 billion of the 8 billion miles Americans drive daily can be changed from less than 4% efficient to better than 70%. Profits from preempting waste will drive job creation and economic growth. GHG's will be less important as energy waste is preempted. Home foreclosures will drop as worker commute costs drop from about $4000 per year to $800. Ingenuity is an iterative process, an exponentially iterative process. Like the Wright Brothers, you have to get 80% of the intellectual process in place before you get a single physical success. Then technical success needs to be scaled to commercial viability. Innovations start small and iterate often as concepts are forged into reality. The Internet did not start with megabit transfers. It started small and grew. We need to begin the ingenuity process immediately. Policy makers need to end central planning and allow any transport system that can be privately funded and beat 100 mpg efficiencies to be deployed. This is 5 times better than current gas mileage standards, 5X CAFÉ standards. Feed-in tariffs removes regulatory barriers to power generation ingenuity. Beat 100 mpg grants rights of way for transport networks capable of better than 100 mpg. “There will be chaos without our plans” is what elected officials and bureaucrats have been saying since the 1973 Oil Embargo. I agree there will be chaos. The creative process is messy. Without attempts you cannot fail nor can you find breakthroughs. Privately financing these innovations attaches a personal and immediate penalty to weak or stupid attempts. Unlike value restraints on private capital, centrally planned failures are not accountable. Our current infrastructure was planned and built at great expense. But we do not fire Congress or city councils when an I-35 Bridge collapses, roads are in poor repair, Peak Oil escalates gas prices or even when waste products change the climate. Policy makers avoid responsibility. Private investors making similar decisions would and should, lose their shirts. Innovators in the messy ingenuity process are rewarded for dumpster diving, for getting into and preempting waste. The well-regulated, centrally planned process is without reward or accountability. Our government is not acting as if is its policies built our infrastructure, created Peak Oil, Global Warming and $4 gas. The Soviet Union was a planned economy, so is our current infrastructure. The Soviet Union failed, our infrastructure is failing; measure it by gas prices and foreclosures. Efficiency Growth can drive Economic Growth. Unlike oil, there is no limit on ingenuity. Unlike oil’s highly stressed supply chain, the more dependent we become on ingenuity, the more nimble our economy can be to adapt to necessities and opportunities.